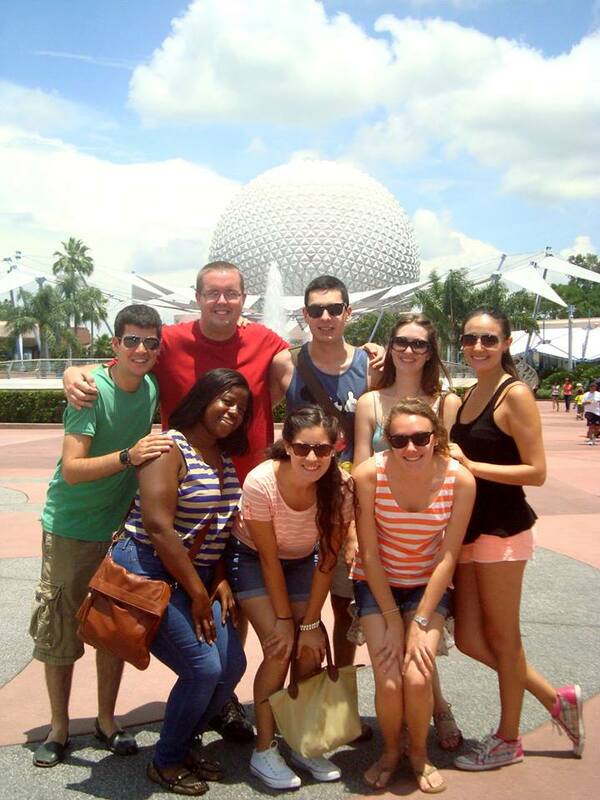 Today was the day that team Philhar took EPCOT by storm. Most of the CPs and ICPs met up nice and early for the 8:30am C bus after only 2 hours sleep. I was first at the bus stop and was surprised to see no-one there, soon Oriol joined, followed by Argentina and Ana Victoria. We all wore sunglasses to mask how tired we are which made us laugh. The bus ended up getting to Chatham late, but we got to EPCOT early at just after 9am. We had others joining us later so we went to Soarin' first and got Soarin' FASTPASSes for later. The plan was that those that didn't have any later on would say that they had lost theirs. Soarin' was better this second time round than the first time I rode it as we got the middle seats on the first (top) row which made the experience more exciting. The girls didn't want to go on Mission: SPACE so I and Oriol went on it. The queue for the green version was only 10 minutes as apposed to 50 minutes for the more intense orange version. Green it was then! Neither of us had ever done the least intense version before. To be honest, I was very impressed! It was a lot more realistic than I had expected it to be but it's nothing like the orange version. Ashleigh and Paul both arrived and we went up to the Soarin' entrance to get in - the guy wouldn't move - no FASTPASS, no way in. So we asked the young girl at the Soarin' desk next to him, and she gave them both rider switch passes. You should've seen his face when we showed him the two extra FASTPASSes - he was so pissed off! As we walked through the FASTPASS queue I looked back, he'd gone back to the Cast Member who had given us the FASTPASSes and he did not look happy. Soarin' this time was a bit disappointing - the back row really does not give you an ideal view at all as you can see the bottom of the screen which ruins the illusion! Next it was time for Ellen's Energy Adventure - clearly no-one enjoyed it as much as I did. I loved it. And you get to sit down for 40 minutes! Lunch for me, Ashleigh and Danielle was steak and fries from the American pavilion's takeaway restaurant. The others went for food in Japan! Next we did the World Showcase rides in Norway and Mexico - whilst on the Mexico ride I got an alert on my phone that the royal baby had been born. I certainly won’t forget where I found out about the big birth! Whilst in the pavilion we also got a photo with Mexican Donald! We wanted photos with the characters so we went to the EPCOT character spot next and got photos with Mickey, Minnie and Pluto. I only need to get a photo with Goofy now and I will have photos with all the fab 5 and that'll be another thing ticked off the bucket list! Next it was off to Innoventions where I, Paul and Oriol found the Great piggy Bank Adventure which I'd read about online - it was so much fun and a great way to teach kids about saving. I really enjoyed it and there was some really cool technology there! The other Innoventions was cool too as we designed our rollercoaster on Sum of All Thrills and rode it. It went by so quickly but was a lot of fun! I definitely recommend taking a look at this. We visited the Seas with Nemo and Friends and then Turtle Talk with Crush. Crush was hilarious and I definitely recommend a visit. It's really fun "dude". Oriol was dying to do Test Track and it had been down almost all day so the park was busier than it should have been. He'd still never done it. We walked towards it and the wait time sign nearby said it was OPEN but had no wait time. We then ran towards it and saw that people were going in but the Cast Member was telling people that it was still down. They were cycling cars so we knew that it was going to open soon so we all got in the single rider line. After about 5 minutes the music turned on and we knew that the ride was back in operation - 5 minutes later we were on the ride! Paul offered to drive us back so we did one last ride on Spaceship Earth and called it a day. Paul dropped me and Ashleigh over at Crossroads where we had dinner at a restaurant - I think it was called Uno - the prices were great, the staff was great and they had a fancy way of ordering and paying with these little tablets on your table which was really cool as you could see your bill all the time and re-order drinks, etc. Our server was really attentive and the staff were nice too. It’s worth a visit! The pizza was really nice - but the pizza they said was for 4 or 5 people was only just about enough for the two of us so keep that in mind. By this point it was close to 10PM and I had been up for 15 hours running on just 2 hours sleep so we called it a night!